This is my second post for today. For my Festive Friday post, please scroll down. Time for a new CAS-ual Fridays challenge and you're going to love this one! Tell me more, tell me more, I hear you saying. Or should I say "singing"! Make a CAS card in summer colours, with hearts on it! I used one of the background stamps from Lotsa Links, and curved it to create a wave and then stamped it in Summer Sun, Only Orange and Tempting Turquoise. I then used the nested heart die from Heart Board Fri-Dies. I finished it off with a sentiment from Brickworks. Now it's your turn - you have until July 18 to link up! Even better, Simon Says Stamp is our sponsor, offering a $25 Gift Card. See CAS-ual Fridays for details! Ardyth this just scream summer lovin' - LOVE! First thing I noticed was the mighty fine DP....that turned out to be hand stamped!!! 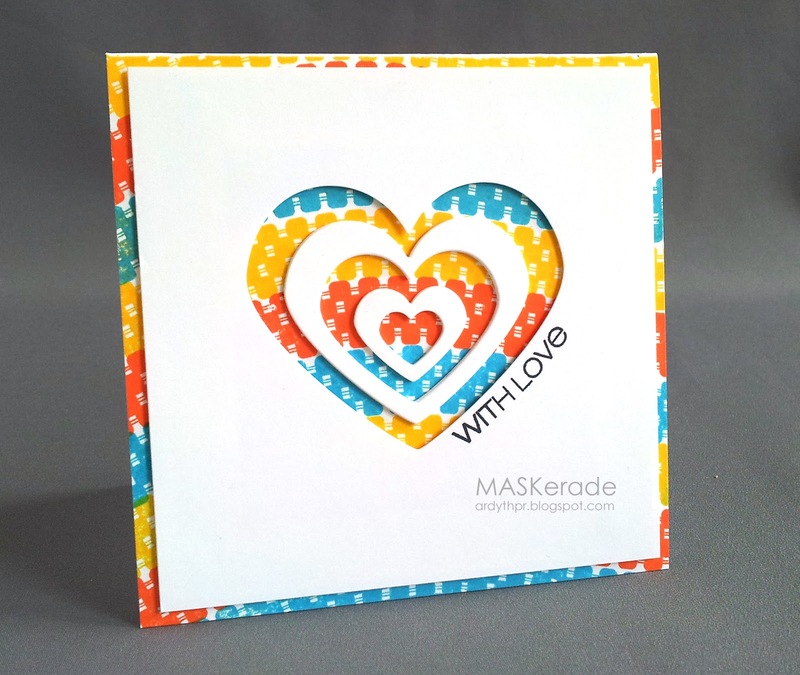 The layered hearts look great, but the sentiment placement steals the show! Such a FUN card!!! Love, love, love! Says summer lovin' to me, just saying. Love the use of the background stamp! So fun! This card is a real wowzer!! I just LOVE this card Ardyth. What a simple and wonderful way to create some summer lovin'. Love that paper beneath the white panel and die cut. All around fabulous!